Dr Julien Benoit made a rare fossil discovery which might be proof of a new species of gorgonopsian. A SENIOR researcher from the Wits Evolutionary Studies Institute (ESI), Dr Julien Benoit, made a landmark fossil discovery on a field trip to the Karoo’s Laingsburg region. Benoit saw a boulder with what seemed to be white teeth on its surface when he was in Western Cape at the end of February. It was then that he found the snout of what could be the largest gorgonopsian – an extinct species once termed “mammal-like reptiles” – fossil yet found. Dr Michael Day, an expert from the Natural History Museum in London, then helped Benoit unearth the rest of the dinosaur’s head. A gorgonopsian is a carnivore that roamed Africa and Russia almost 260 million years ago, during what is known as the middle Permian period. Benoit described the animal to Wits Vuvuzela as “a hairless, reptilian-looking hyena with large sabre-like canines sticking out of its mouth”. Its body was strong and muscular “with almost sprawling legs”. The director of the Centre of Excellence in Palaeosciences at Wits, Dr Bruce Rubige, told Wits Vuvuzela the fossil discovered by Benoit was in an elusive type of rock likely to be spotted only by an observant collector. Rubige, who organised the field trip, said gorgonopsian fossils found in the past were roughly 15cm long, no bigger than a human hand. Benoit’s discovery is, however, almost double that size, which led the team to believe the fossil might be proof of a new type of gorgonopsian. Little is known about the species because its fossils are scarce and rarely studied. Rubige said this was usually the case when it came to flesh-eating animals. The gorgonopsian fossil is in the process of being cleaned from its surrounding rock. Benoit said, however, the size of the find made it significant because its largeness contradicted a theory, Cope’s rule. The rule says most species start out small and gradually evolve bigger, but the fossil Benoit found is the size of a lion’s head, which suggests the animal may have been large to begin with. She said Benoit’s gorgonopsian find could reveal much about the environment about 250 million years ago. 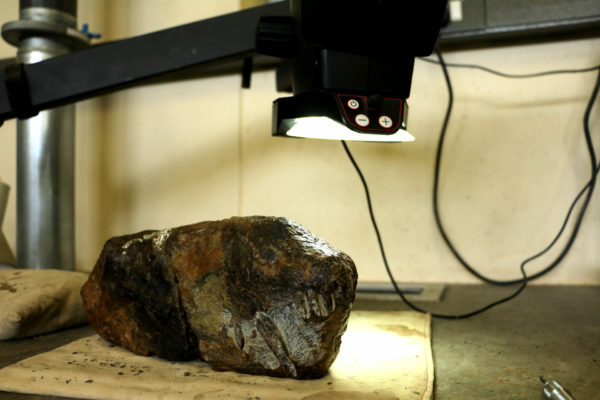 The fossil is now being cleaned from the rock surrounding it and will be studied by a specially trained Wits student. Benoit said that thereafter a new species name will be introduced, as the team is certain they have discovered a new family under the gorgonopsian species. Their research results will then be submitted to a scientific journal to allow scientists around the world to evaluate the discovery’s quality and significance. He hopes the discovery will revive interest in gorgonopsians and hopefully lead to new knowledge about them. The team at ESI, along with Benoit, recently published a paper on the origins and evolution of whiskers in mammalian ancestors. FEATURED IMAGE: Charlton Dube, a technical coordinator at ESI, cleaning the gorgonopsian fossil.